Well a Carling Cup quarter final defeat to Money Bags City was a result most of us were probably expecting and as I woke up this morning I have to reflect on a performance which probably didn't deserve us to be on the wrong end of a negative score line. I felt the game should have ended 0-0 and in the old fashion days of replays, we'd have headed to their gaff, with the first match ending as last night should have - a stalemate. But it wasn't to be. And even though we've lost our unbeaten run, I think we can take pride in our players, manager, staff and club for the way they conducted themselves last night and throughout the league cup campaign. We can be honest. It's the forth competition we'd want to win at the start of the season. But it's always one of the most exciting early season highlights for us Gooners, as we get to see Arsene Wenger's next crop of young players take centre stage. In more recent years it hasn't been a competition where we've played 11 youngsters. There has been a progression towards a mix of squad players and those progressing well in the reserves. And as we've seen the squad's average age become older, as have Arsene Wenger's league cup teams. Last night it was a chance for Alex Oxlade Chamberlain, Emmanuel Frimpong, Francis Coquelin and Ignasi Miquel to shine. Against a Manchester City team which had just one player (Nedum Onuoha) graduating from their academy, Wenger's side boasted four - Johan Djourou, Emmanuel Frimpong, Francis Coquelin and Ignasi Miquel. With the likes of Thomas Vermaelen, Andrey Arshavin and Gervinho available for selection on the bench, Wenger had trusted his young players to come good against Roberto Mancini's multi millionaires. And it so nearly happened. Wenger made ten changes to the team which drew with Fulham at the weekend with Johan Djourou keeping his place on the right hand side of the defence. Lukasz Fabianski remained as league cup keeper, with Laurent Koscielny, Sebastien Squillaci and Ignasi Miquel making up the remainder of the back four alongside Djourou. In the central midifield roles were Coquelin and Frimpong with width provided by Oxlade Chamberlain and captain for the evening Yossi Benayoun. Ahead of them in a two man strike force were Ju Young Park and Marouane Chamakh. Wenger opted for a 4-4-2 formation and from my seat in the Upper Tier at the Grove, it looked as though it took some time for the players to settle into the change of formation. There was a fantastic atmosphere inside the ground. As expected Samir Nasri played the part of the pantomime villain - his every touch greeted with a chorus of boos from the home support. In a way it appeared he revelled in it - wanting to touch the ball at every opportunity - even taking throw ins. It was like the Frenchman had a point to prove. That he had bettered himself by leaving us last summer. But in my opinion it appears we got the best five months out of his career so far this time last year. He was on fire. Now he appears a shadow of the player he was. And the chant aimed at him: "You only left for the money" could not have been more well put. It's no wonder Emmanuel Frimpong was asking if he wanted to buy one of his "Bench" t-shirts. Nasri's star has fallen so far he's spent more minutes on Mancini's bench than on the pitch for his new employers. An Arsenal attack in the tenth minute got me off my seat - and I thought we'd taken the lead - only for a fantastic save from Costel Pantilimon in the visitor's goal. Chamakh who in my eyes was hard working throughout the first half pushed the ball to Coquelin on the right. His low cross found Park at the back post. The Korean’s shot was good but not good enough to beat the Romanian who stuck out a left hand to prevent us taking the lead. The game didn't lend itself to a lot of chances being created. The Gunners back four worked tirelessly to prevent any openings and Frimpong and Coquelin prowled the space in front of them, closing down and nullifying the visitors forward play. It was this work which allowed Arsenal to probe and most of that work was done on the right, with Oxlade Chamberlain providing only our real threat. The visitors defenders did not know how to deal with the tricky and tenacious teenager. When he had the ball at his feet, Mancini's players would back off and back off Oxlade Chamberlain. They feared what he could do with the ball. His goal-bound effort on 28 minutes had Pantilimon in action again. Chamakh the provider of the key pass which set the former Southampton man free. His first time shot towards the top corner was going in but for the Romanian's save. The influence the Ox was having on the game force Mancini into making a change to his line up after just 32 minutes. Kolarov was withdrawn with multi-million pound striker Sergio Aguero coming on and Nasri switching to the left of the visitor's attack. With the introduction of the Argentinian international it appeared to me that the Gunners were in fear of City's star player. But good early interventions from Koscielny started to resettle the nerves. I thought the French defender was superb in his all round display last night. He certainly gave Arsene Wenger something to think about when he picks the team for Saturday's trip to Wigan. The Frenchman dominated Aguero, was at ease with Nasri and always had the better of Dzeko. Special mention has to also go to Sebastien Squillaci. There have been fans who have got on his back following some of his performances last season. For me, I never believed he was a bad defender. He was a player adapting to a new league and perhaps needed more adaption time than many were prepared to give him. Last night I thought he had a good game alongside Koscielny and the pair of them had the better of Aguero and Dzeko. Weren't we told last season the two Frenchmen couldn't play together? Last night proved they can and do well against arguably the league's best strikers, bar RVP of course! At half time it was a stalemate and I thought Arsene Wenger needed to make a change up front with Gervinho's guile offering us more than what Park had shown during the opening 45 minutes. Both teams re-emerged from their half time oranges with neither manager making a change. The opening exchanges were Arsenal followed by a brief City foray into attack. Dzeko with two chances, neither of which forced a save from Fabianski. At the North Bank end, which Arsenal were attacking, Oxlade Chamberlain started where he left off, forcing a save from the City keeper after a drive using his weaker left foot. Halfway through the half, Gervinho is called on and replaces Park. His introduction just added to the Arsenal threat. For all of City's millions, they'd been woeful going forward. Their fans weren't much better either. I switched seats last night to the Upper Tier from my usual North Bank spot and as I was closer to the extended away section I thought I'd hear more of them. It was the opposite. They were a joke. A few "witty" first half chants and that was them done until after they'd scored and at the end of the game when they celebrated like they'd won the competition. We often think Chelsea have a lot of Johnny come lately fans. It seems Manchester City have become the latest team fashionable to support. With the Ivorian and The Ox on either flank, Benayoun pushed forward into a more central position and should have got his head on the end of a Oxlade Chamberlain cross to put the Gunners into the lead but the Toure got to the ball first. Vermaelen replaced Miquel and Arsenal went in search of a goal which might have won them the tie and seen us progress to the semi-finals. But then came the sucker punch. Two minute later the visitors had the ball in the back of the net. Aguero with the goal after Johnson skipped past a joint challenge from Benayoun and Koscielny played the ball in Dzeko who knocked it back for the Argentinian to slot pasted Fabianski. It was a break from our own attacking corner at the other end and really we should not be giving the ball away like that in that area. The City fans celebrated but then the home crowd got behind our boys and it was wall to wall Gooner noise until the final whistle. Try as we might we couldn't get a goal. Chamakh had a good chance at the end. But he couldn't find that extra inch which would have put the ball in the back of the net from an excellent Gervinho cross. The expression on the manager's and Robin van Persie's face said it all. That should have been in the back of the net. At the end the City fans celebrated and it was frankly embarrassing. It was a victory over a much weakened Arsenal team who despite being the underdogs should have taken something from the game. 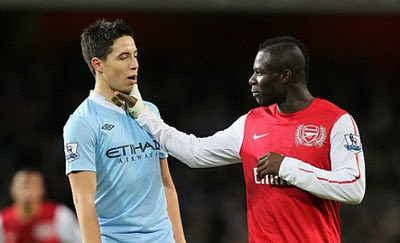 It appears the Nasri/Frimpong situation came to a head in the tunnel. Although the club are keen to play down suggestions that anything untoward happened. Afterwards Arsene Wenger was critical of our defending for their only goal. "I felt we were a bit naive because it was a corner for us and a goal for them. I knew that we were in trouble and I feel we didn't take enough time to take the corner because Djourou was just going up front and he had to stay at the back on the corner. We didn't leave him enough time to come back and that's where we were caught. "I felt as well that we didn't take the corners very well but overall what is frustrating that we lost a game at the moment that we looked the winner. It is frustrating because we put a lot of effort in and we were not rewarded. On the other hand I feel that considering the youth of our midfield we have battled really well and have shown some fantastic quality." I think we can be disappointed we didn't take something from the game. We worked hard as a team and I think our team performance as a whole was better than City's. But from last night's showing, we seriously need to look at strengthening our striking options in January. Chamakh and Park are off the pace at the moment, maybe through no fault of their own. But if the worst happened, we would need someone to come in and offer a threat and neither of them can claim to offer any defence a RVP size problem when they play. This defeat won't blow our mental state open. It's a blow but not fatal. We'll go on to the Wigan game knowing we might have won on another day, but proud in our performance and certainly show the same fight as we did against the league leaders. I'm sure the players will just want to focus on continuing our winning form away from home in the league. We've got a title to fight for!